Water- and sanitation-related issues can be a matter of life and death in many regions of Africa. 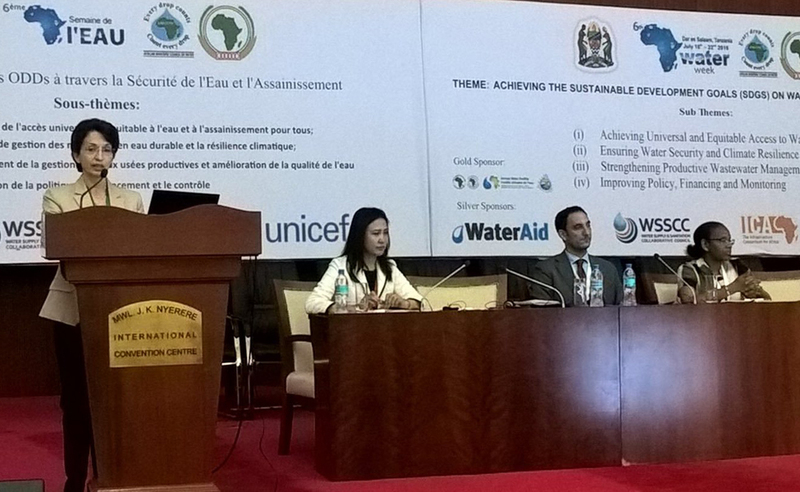 Achieving the Sustainable Development Goals on water security and sanitation was the main focus of this year’s African Water Week, a biennal gathering that brings relevant stakeholders together to seek and discuss solutions. UNESCO’s International Hydrological Programme (IHP) organized over 10 events during the week, to help prepare the implementation of the water-related goals as a driver for life in Africa. IHP sessions, side events, trainings and workshops added content to the sub-themes “Ensuring Sustainable Water Resources Management and Climate Resilience” and “Strengthening Productive Wastewater Management and Improved Water Quality”. IHP co-led the sub-theme “Strengthening Productive Wastewater Management and Improved Water Quality”. Its sessions focused, respectively, on water quality and wastewater, ecohydrology, and water and jobs. IHP helped to formulate and address urgent needs: strengthening scientific knowledge and adopt appropriate approaches, both technological and policy related; monitoring emerging pollutants in water resources and wastewater and assessing their potential human health and environmental risks; preventing and controling the pollution of water resources and the environment. The exchanges highlighted that it is essential to enhance capacity development and raise the awareness of water professionals, as well as of other stakeholders such as policy-makers and the public. The African Ministers Council on Water (AMCOW) and the Government of Tanzania convened the 6th AWW from 18 to 22 July in Dar es Salaam, Tanzania, under the theme “Achieving the Sustainable Development Goals (SDGs) on Water Security and Sanitation”. The 6th AWW reaffirmed the political commitment at the highest level to create a platform for collectively seeking and discussing solutions to Africa’s water and sanitation challenges. This edition of the biennial event attracted over 1000 participants from governments, regional institutions, international partners, the private sector, the scientific community, civil society, NGOs, youth and the media from all over the world, and in particular Africa. The AMCOW Governing Council decided to institutionalize AWW as a way of building momentum on achieving the SDGs related to water and sanitation by 2030, the 2014 Dakar Declaration on Water Security and Sanitation, the N’Gor Declaration on Sanitation and Hygiene, and the Africa Water Vision 2025. All Ministers of Water in Africa held the 10th General Assembly of AMCOW during the 6th AWW and agreed on a comprehensive plan of action for Africa to implement high-level commitments such as the N’gor Declaration at country, sub-regional and continental levels. The IHP International Initiative on Water Quality (IIWQ) and its flagship project on “Emerging Pollutants in Wastewater Reuse in Developing Countries (2014-2018)” showcased Emerging Pollutants in Water and Wastewater: UNESCO Project Case-Studies in Africa, attended by 60 experts, 23 of whom were women. The session shared knowledge and promoted effective technological and policy responses, as well as best practices on emerging pollutants in water and wastewater, by presenting main findings of five out of 16 UNESCO case-studies developed in Africa, respectively from Ethiopia, Tunisia, the Lake Victoria River Basin and Nigeria. In the IHP-IIWQ session on Science and policy towards water quality and wastewater SDGs in Africa, 120 people, including 33 women, participated. The session aimed at mobilizing and integrating science and policy. The participants discussed how IIWQ could help Member States to address water quality and wastewater challenges in Africa, so as to achieve water quality related SDGs. They focused on research, knowledge generation and dissemination, and effective and innovative policy responses to protect and sustainably manage the quality of freshwater resources, including by appropriately handling wastewater. The IHP session on Wastewater-related Diseases, Risks and Intervention measures in African Cities and the Global Water Pathogen Project (GWPP) gathered around 100 participants. It presented innovative solutions and financing, and an integrated approach (Water Sanitation and Hygiene, agriculture, and energy) at the regional level, together with perspectives and approaches from Tanzania and Kenya on water and sanitation issues. As an innovative knowledge exchange mechanism, GWPP supports African Member States in their efforts to meet SDG 6, helping decision-makers, researchers and practitioners equally. This session followed the GWPP workshop on “Contributing to productive wastewater and excreta management in Africa” organized in Dar es Salaam prior to the 6th AWW on 16 July. The workshop promoted GWPP for extensive use in Tanzania and Africa in general and gathered feedback from participating experts on the project's outputs to tailor them to their needs. The event presented and discussed the main GWPP deliverables with more than 80 experts (20 women), decision makers and media professionals: a state-of-the-art publication on water pathogens and their treatment, as well as a complementary internet platform to share the knowledge base. Experts from all regions of the Republic of Tanzania attended, along with water utilities, regulators, three Ministries (Water and Irrigation, Heath, Education, Science and Technology) and at least 3 universities, and research centres among others. IHP organized a session on Ecohydrology for sustainability and water security in Africa attended by around 60 people, with close to 20 being women. It promoted the upscaling of the ecohydrological methodologies from scientific base concepts to becoming part of a national water master plan as an important tool for the implementation of Integrated Water Resource Management (IWRM) in compliance with the relevant SDG targets 6.5 (IWRM) and 6.6 (water-related ecosystems). The session noted the necessity of broad dissemination of the ecohydrological methodology as innovative, low energy/low cost advanced science approach: ecosystem processes and biotechnologies are used as “dual regulation” in the systemic framework provided by the ecohydrology principles for governance at national, regional and international levels. The IHP session on SDG 8: Water for jobs and the role of young professionals was attended by 60 participants, 23 of which were women. The session highlighted that water, though essential to create and sustain jobs in every sector of the economy, suffers from skill shortages which makes it difficult for employers to fill entry-level positions. The session emphasized the role of education in addressing this gap in the water sector while promoting equal access to information and communication technologies (ICT). The use of Free and Open Source Software (FOSS) helps to close the digital divide between countries and to create innovative jobs. The session concluded that development cannot take place without jobs and that there is need to support young professionals through sustained investment in (1) education, providing access to science and engineering, and (2) green technologies and continuous innovation; also, policies related to job creation, socioeconomic development, and poverty reduction should be designed and implemented in an integrated manner. The session underlined that policymakers can promote social and economic development by facilitating job creation and inclusive private sector-led growth, understanding what drives job creation, and what obstacles prevent the private sector from generating jobs. Under the AWW sub-theme “Ensuring water security and climate resilience”, IHP organized one session on climate resilience and a series of sessions and trainings on groundwater governance and the SDGs. Approximately 100 experts, policy makers and practitioners, among them over 20 women, participated in the IHP session Early Warning Systems for water extremes and climate change in Africa to exchange on and assess progress, challenges and needs concerning the use of data, as well as technological and scientific advances in support of water-related SDG implementation and monitoring in Africa. The IHP organized three sessions on topics related to groundwater governance, the SDGs, and international water law in collaboration with the Ministry of Water and Environment of Uganda, GEF, FAO, the World Bank, IAH and UNECE, as well as a training on Groundwater Management in Transboundary River Basin Organizations in collaboration with BGR and IWMI. The sessions and training highlighted that: (1) groundwater resources represent the most important source of freshwater in Africa, (2) access to drinking water, sanitation and hygiene cannot be achieved without the development and proper management of groundwater resources, (3) although groundwater is included in the original theoretical framework of IWRM, it still remains largely outside of implementation efforts, and (4) sound groundwater governance is crucial to achieving the SDGs as groundwater is linked to about 20% of all the SDG targets. The sessions and the training presented policy and institutional guidelines, recommendations and best practices designed to improve groundwater management at country/local level and groundwater governance at local, national and transboundary levels. They thus offered means to country representatives and water professionals to improve groundwater governance both at domestic and transboundary levels. More than 140 people participated, among them around 35 women.